The gorgeous landscaping on this 54 acre property inlcudes 3,500 trees, lush gardens and tropical vegetation with a 11,000 square foot swimming pool as the centerpiece. Located just 15 minutes northwest of The Las Vegas Strip in the affluent master-planned Summerlin community and surrounded by championship golf courses, the JW Marriott Las Vegas Resort & Spa features 548 guest rooms. The two towers that comprise this elegant resort each possess a distinct interior design while merging with Spanish revival architecture. A fabulous state-of-the-art spa and fitness center, fine dining, world-class golf, and all the pampering services and amenities that have become synonymous with the JW Marriott name are available to guests. The Rampart Casino features 50,000 square feet of gaming space, and expansive conference, meeting and special events facilities can accommodate groups of up to 4,000 people. 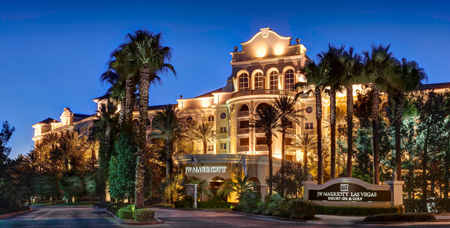 Though the JW Marriott Las Vegas Resort & Spa affords a nice respite from the hustle and bustle of the Strip and downtown, complimentary shuttle service is also provided for guests seeking the unmatched excitement of Las Vegas. 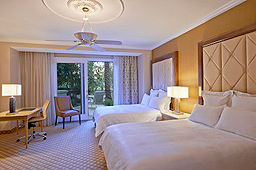 Golfers will appreaciate The JW's close proximity to eight championship golf courses. 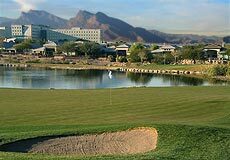 Within a five minute drive of the resort sit such world-class courses as Angel Park Golf Club, Badlands Golf Club, Bear's Best Las Vegas and the TPC Las Vegas. The TPC is a PGA Tour facility open for public play and Badlands has won many honors as one of the best (and one of the most challenging) layouts (27 holes) in the valley. Packages and tee times for these courses can be arranged through the resort. 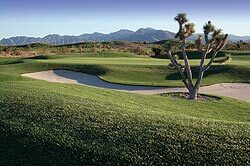 The Angel Park facility across the street from the JW Marriott boasts 2 challenging 18-hole layouts, and also features a 12-hole par three (9 holes are lit for evening play), a unique 18-hole putting course, and a driving range that also is lit for night practice. The JW Marriott is also within 1/2 hour's drive of a multitude of Vegas area courses, most easily accessible through the freeway system, enabling one to avoid the congested traffic on the Strip. Close by are: Siena (12 minutes), Rhodes Ranch (20 minutes), Paiute (20 minutes), Painted Desert (15 minutes), Silverstone (20 minutes), Sun City Highland Falls and Palms (15 minutes), Bali Hai (20 minutes), Las Vegas National (20 minutes), Wildhorse (25 minutes), Stallion Mountain Courses, Royal Links and Desert Pines (25 minutes) - and all the Henderson courses (Rio Secco, DragonRidge, Tuscany, and Black Mountain) are also within 1/2 hour - depending on the time of day. 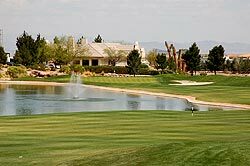 The Reflection Bay and Fall Courses will take just a few minutes longer.The fabulous courses in Primm are less than 1 hour away, as are Wolfcreek, Oasis, Palms and Casablanca in Mesquite. It will take an 1 3/4 hours to reach Emerald River and Mojave in Laughlin, and about the same amount of time to Coral Canyon and Entrada in St. George, Utah. Informational pages and reviews for all of these courses - each with web links, are provided for in our Vegas course and review sections. Links to these pages are available in the links section near the bottom of this page. 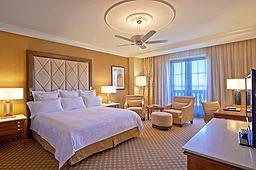 The resort features the Spa and Palms Towers, with a total of 548 guest rooms and 70 suites, ranging in size from 560 to 6,700 square feet. 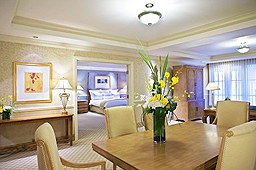 All rooms and suites have been beautifully renovated and provide a luxury retreat in Las Vegas. 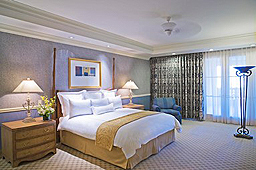 The efficiency and comfort provided by the JW Marriott Las Vegas is remarkable. Want an upgrade? One and Two bedroom suites provide oversized bathrooms and spacious living areas with outdoor verandas, and measure up to 2,340 square feet. The newly renovated RAMPART CASINO is quickly becoming a local favorite, with over 50,000 square feet of gaming space providing play on 1200 slot machines and 40 table games. 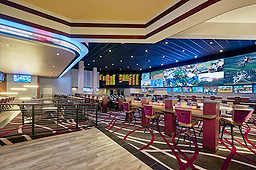 The new Sports Book offers giant screen TV's and comfortable seating for betting and sporting entertainment. 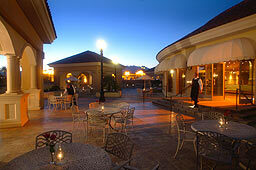 Hotel lobbies and walkways at this spacious resort compliment the elegance that is a standard for JW Marriott. The JW Marriott POOL AREA is set in a lushly topical environment, complete with poolside cabanas that can be rented daily. Misters, televisions, comfortable chairs and refrigerators are standard with each unit. The pool features a section with 25 yard lap lanes, and also includes a general swimming area with cascading waterfalls. 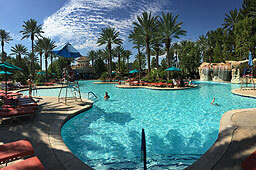 Two large jacuzzis are adjacent, and beverages, sandwiches and snacks are available with poolside service and bar seating. 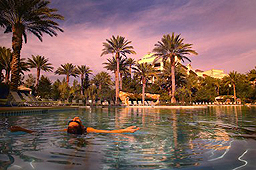 As with most Vegas properties, the pool area closes during the winter season. Call for dates. SPA AQUAE is among the best in Vegas, and is certainly the most unique. 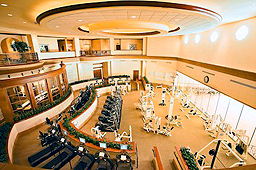 This 40,000 square foot facility boasts a state of the are fitness center, with an aerobics room, free weights, the latest machines, and dozens are cardiovascular units - each equipped with CD players and mini television monitors featuring cable stations. Private men's and women's spa areas include steam rooms, saunas, hot and cold tubs, foot and shoulder massage baths, lockers, complimentary toiletries (you need not bring anything but a swim suit/work out clothes), and a lounge with large screen TV. Fruits, spring water and juices are complimentary. Secluded treatment rooms (36 in total) are scattered about the facility, and serve as relaxing venues for massages, facials, aromatherapy, body wraps and loofah scrubs. On outdoor area also provides a jacuzzi, steam and sauna for those wishing to go coed. The outdoor pool adjacent to the fitness facility features a dozen stations equipped with water jets - designed to offer an "aqua massage" that is truly heavenly. One can also venture to the lap pool for exercise, and return to bask in the serenity of the wonderful spa. There is a daily fee for the Spa Aquae, but one may come and go during the course of the day. A wonderful variety of dining options are available at the JW Marriott. 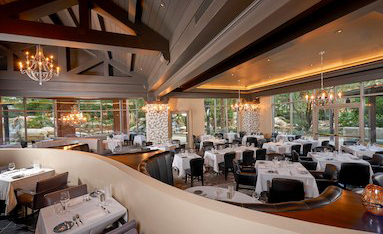 For more complete information on the fantastic array of dining options at the JW Marriott Las Vegas Resort & Spa, visit the dining section of their website by clicking here. 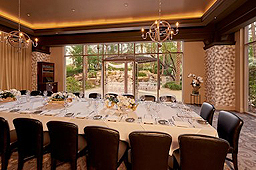 The JW Marriott Las Vegas Resort & Spa offers 37 event rooms with 115,900 squre feet of flexible meeting and banquet space including 3 ballrooms and 32 breakout meeting rooms. Spacious foyers, excellent connectivity, and state-of-the-art audio/visual equipment are available. 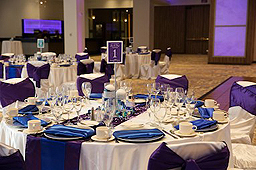 In addition to a full compliment of Business Services, High-Speed Internet Access and Professional Catering, Experienced Planners will assist you with everything from ballroom rental to hotel room blocks. For more information on hosting a conference, meeting, event or wedding at the JW Marriott Las Vegas Resort & Spa, please visit the meetings section of their website by clicking here. 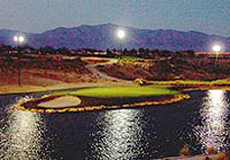 Check out the Two Guys Who Golf Las Vegas Golf Course Review page: click here. From McCarran International Airport: Take Interstate 15 North to Expressway 95 West ( I-515). Exit at the Summerlin Parkway. Take the Summerlin Parkway to the Rampart exit and turn left. Turn right at the JW Marriott Las Vegas Resort.